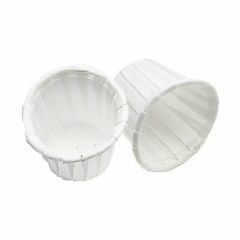 Paper Souffle Cups are made with heavy duty multi-pleated paper with a rolled wax trim that is strong enough to hold condiments without seepage. Easy Storage. Good Value. Lightweight. Oral Care. Meds . crafts. I gave these a try after it was suggested at checkout... I used to buy the plastic 1 oz dose cups. Nothing wrong with them, but this is just a better value. With my daughter taking chemotherapy, we were going through plastic cups like crazy, gave these a try and now it's all we ever use. I use them mainly for her Biotene and Nystatin (routine oral care), sorting out her pills, etc. My kids use them for crafts, I can pour glue, paint, beads, whatever. And yes you can use them as dipping cups too! They are not graduated like the plastic cups, but I always dose with a syringe anyways (it's more accurate). Good Value. Sturdy. Easy Storage. Lightweight. Durable. We use these as sample cups for yogurt. RN entreprenauer. Caregiver. Medical Professional. it is a good size for holding sauces and condiments for dipping and you can pull the rim out to make the opening bigger, if needed.